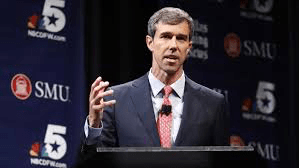 More foaming at the mouth about Beto O’Rourke…. The 2020 Democratic Presidential nomination is ALREADY playing out it seems like…. Democratic rising star Beto O’Rourke’s team has been fielding calls from senior operatives who worked on President Barack Obama’s campaign in the pivotal states of Iowa and New Hampshire as the Texas congressman considers running for president in 2020, CNBC has learned. Led by chief of staff David Wysong, O’Rourke’s inner circle has been engaging with political players from the states, which hold the earliest contests of the presidential primary season. These people include leaders of Obama’s campaign operations in the states, according to multiple people with knowledge of the conversations. While people close to O’Rourke insist that the discussions have not led to any hires, a former senior Obama administration official, who spoke on the condition of anonymity, said it is clear O’Rourke will have the consultants in place to help guide him if he chooses to make a run for the White House. “This is the phase for someone exploring a presidential campaign in that they’re doing everything they can to decide who they may want to run an organization and who they could turn to if he enters the race,” the former Obama aide said. O’Rourke is fresh off a surprisingly close defeat at the hands of GOP Sen. Ted Cruz in reliably Republican Texas. He has been credited with lifting fellow Texas Democrats in House races to victory last month as the party flipped about 40 seats to take the majority. O’Rourke broke fundraising records and galvanized young voters in his Senate campaign, a possible indication of the kind of appeal Democrats will need to take on President Donald Trump. Yet, the fact that he lost a statewide race is giving some in the Democratic Party pause about a potential O’Rourke run. “You don’t promote a loser,” Chicago Mayor and former Obama White House chief of staff Rahm Emanuel said recently…..
Rep. Beto O’Rourke (D-Texas) reportedly spoke late last week with Democratic activist Rev. Al Sharpton as the congressman mulls a possible White House bid. O’Rourke has already had a sit down Obama…. If he can harness the black vote from Biden? His chances of becoming the 2020 Democratic nominee will skyrocket…. An endorsement from Rev. Al Sharpton (who has yet, so far as I know, to admit any responsibility for the Tawana Brawley scandal that caused one completely-innocent man to take his own life) is definitely a turn-off for me. I find it shameful that President Obama took Sharpton onto his White House staff. But the he DOEShave a followering and EVERY Democratic none in the last few decades has had his blessing.,,. Right now i’d Think Ole Joe has the black vote which is ESSENTIAL for the SC primary. Beto IS courting Black politicians…. “Beto O’Rourke hasn’t made up his mind about a possible presidential run in 2020, but behind the scenes he’s speaking to potential kingmakers among a constituency whose support he’ll need in a Democratic primary: African-Americans,” NBC News reports. One of those people is fellow 2018 progressive darling Andrew Gillum. …. Beto is starting to look very real for 2020. And maybe more than that, whether he runs or not appears to have frozen the Dem field. Think about that: His decision might be the biggest shoe to drop in the 2020 Democratic race….